The English dictionary recognises the word, Mittyesque, as an adjective that basically describes a daydreamer. This contribution does not come from the movies, but from James Thurber's short story, The Secret Life Of Walter Mitty. The Ben Stiller movie is the second Hollywood film that is based on the above story, and Thurber was reportedly not happy with the first version. Given that Stiller does not take a very different approach (when compared with the first movie), one wonders if Thurber is rolling in his grave right now. Walter Mitty (Ben Stiller) works in the Negative Assets division of the famous LIFE magazine company. The magazine is going through a few changes, including going online completely, and Walter is not sure if his employment status will be changed. Renowned photographer Sean O'Connell (Sean Penn) has sent him the negatives of his latest project, and mentioned that Negative 25 should be considered for the cover of the last issue of the magazine. Unfortunately, 25 is missing, and Walter decides to solve this mystery by first deciphering what the other photographs are all about. Walter has a problem. He is in love with co-worker, Cheryl (Kirsten Wiig), who barely knows of his existence. He is known to zone out very often, which is when he escapes into a land of fantasy in which he is a hero - these incidents are inspired by everything happening around him. In reality, he has barely travelled, or done anything worthwhile, and these escapades make him lose out on important information. In the meantime, the transitions management person (Adam Scott) is breathing down his neck to take a look at the processed Negative 25. In short, Walter is in trouble. Unlike the original story, the movie completely lacks the tone that the tale should have had - satire. There is no irony in the movie. It is a simple story of an underdog who finds his calling. Also, the setting - LIFE - is a bit out-dated, or at least the problem is. Turning everything online is not a new issue. Walter's relationship with Sean is ambiguous at best, so the sudden epiphany that the two of them seem to share is rather random. The philosophy, if any, is lost on the audience. The romance lacks punch, as do the dialogues. And towards the end, the plot seems too contrived, but the conclusion is satisfactory enough for you to forget that the middle portion lagged in parts. Ben Stiller tries a little too hard to be the sincere Walter, and while he is convincing as far as acting is concerned, there is something very "off" about him. Kirsten Wiig, otherwise known for her humorous roles, is too restrained. Adam Scott is out of place, and Sean Penn is wasted. Shirley MacLaine could have done some damage control if she had a larger role. The redeeming factor in the film is the cinematography. Sticking mostly to bleak landscapes, the makers have managed to instil a sense of desolation and monotony that the character embodies. The title montage deserves special mention. The production and costume designs are above average, and the music is pleasant. The editor could have been more generous with the number of cuts, although it is not a very lengthy movie. 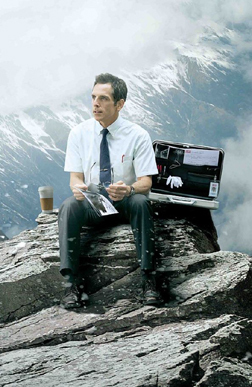 Watch The Secret Life Of Walter Mitty if you are a fan of the short story, but do not expect wonders. And watch if you are (a) a Ben Stiller fan, and (b) desperate for some great visuals. Be the first to comment on The Secret Life Of Walter Mitty! Just use the simple form below. fullhyd.com has 700,000+ monthly visits. Tell Hyderabad what you feel about The Secret Life Of Walter Mitty!